Reading the headlines you may wonder: is prednisone over-prescribed? Sensational headlines are not new. But I did a double take when I read Steroid Over-Prescribing Persists in RA. My natural reaction is to defend patients: “Steroid overuse? Who would take steroids unnecessarily? This is just another side effect of pharma ads leading the public to believe RA is basically cured.” I’ve encountered this attitude everywhere, including doctor’s offices: Biologics solve the RA problem, so why would you need steroids? So, is prednisone over-prescribed? Let’s have a look. This Medpage Today article is a discussion of a study of about 16,000 people with rheumatoid disease (PRD) in the UK who were followed from 1992 to 2009. The average steroid dose was 7.5 mg. The original study was published in Arthritis Research & Therapy: Half of UK patients with rheumatoid arthritis are prescribed oral glucocorticoid therapy in primary care: a retrospective drug utilisation study. The research itself is important and the results are interesting. 1) Too many PRD are taking too much steroids. RA Warrior Response: Ok, about half of PRD still need steroids despite whatever modern treatments are available. If you spend time listening to patients or reading clinical studies, that’s not a surprise. What does it tell me that more than half “receive” over 10 mg per day? It tells me that the miracle drugs are not miraculous, and many people still have inflamed joints. 2) Steroids ease the pain but they have side effects so they should be used less. Yes, all patients with all conditions must consider whether medicine’s benefits outweigh its risks. Do you realize that weighing risks and benefits is also a huge issue with DMARDs (disease modifying drugs) and Biologics? People have to consider those side effects as well. Unfortunately, “the shortest possible time” may be a long time if other drugs are not effective and the disease is active. 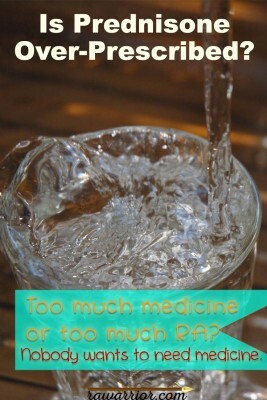 Unfortunately the “lowest effective dose” varies based on genetic differences that PRD cannot control. While 5 mg may work for one person, it may take 20 mg to get the same response in another person. 3) Use a variety of alternatives because steroids are risky. 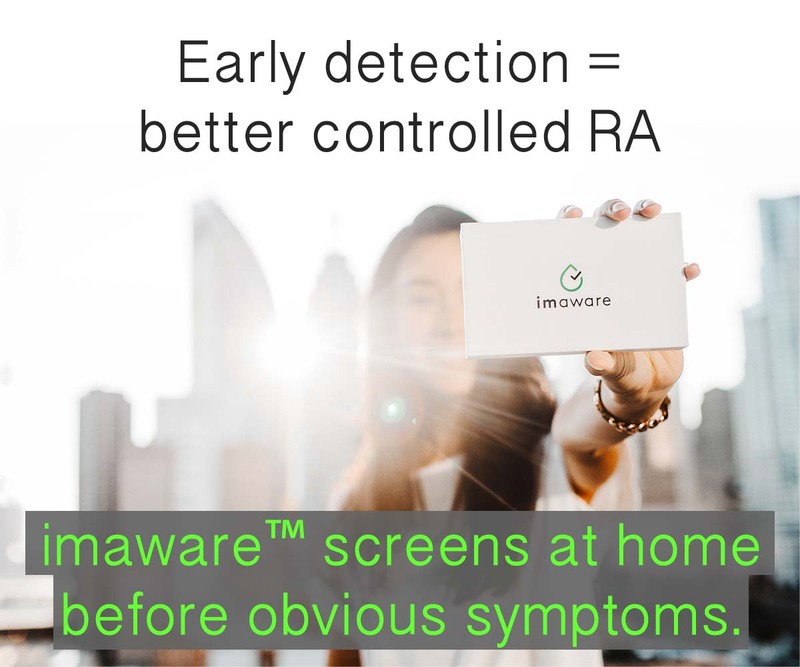 RA Warrior Response: This is technically true, because risk to benefit assessment should always be done for every treatment. What should also be considered, but isn’t discussed in this article, is how disabling rheumatoid disease is. This is the reason steroids are used when nothing else works. How can we neglect to consider the cost of not being able to move? It’s significant in at least two ways. Disability makes a person less productive for herself, her family, and society. Bone and muscle loss results from less weight-bearing activity. Is prednisone over-prescribed, a needless holdover from the 1950’s? Is it a foolish easy way out for those who ignore the cure? Or are steroids one of the valuable classes of medicine to help mankind? 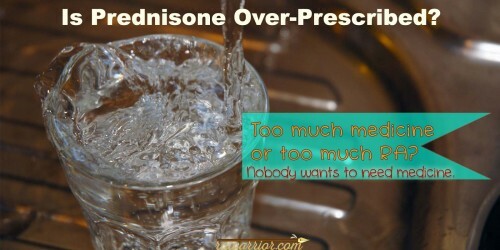 What do you think: is prednisone over-prescribed? Steroids were invented for rheumatoid disease. But today they are used in many forms for a multitude of diseases, including cancers. No one denies they have a dark side. And no one wants to need them. But are they prescribed to PRD needlessly? Or do most people use them when nothing else works? Don’t hate me ! But I do think that Drs. use steroids as an easy way out, way too much of the time. I was on it for years when I was little, and didn’t know any better. It ruined my spine, and gave me stomach issues. It also thins the bleep out of your bones, which RA people don’t need. So for me, it just added more pain and problems. I hate steroids and try to avoid them at all costs. We ALL hate them, but after 10 years I still must use them from time to time due to inflamed joints. There’s really no other choice, is there? I was without a working biologic for an entire year before my rheumy decided to ‘try’ another route and ‘try’ Xeljanz. Without steroids I wouldn’t have been able to get out of bed! yes not much choice to try to move – – delayed using them for several years but I can barely do many things even with them. I’m hoping and praying there will be something else that helps. My diagnosis is very recent, just a few months ago. I’ve had a couple of steroid treatments, though, and these have reduced my inflammation enough do that I can carry on daily life. I appreciate them and trust my doctor. I spent the first 4 years taking 80mg daily, along with 2000mg ibuprofen, methotrexate, and 1-2 narcotic pain pills daily, along with different biologicals. I still ended up in a wheelchair, had to move in with my father because at one point I was unable to get out of bed for 4 days (ewwww – that mattress was trashed). 7 years out I am so glad to be down to 5mg prednisone daily. I have most of the nasty side effects, most of the adaptive equipment and still in a wheelchair. But I can get some enjoyment out of life now. A major reason to consider at least a short course of prednisone is finding yourself in major pain during the time after carefully planned and scheduled, completely necessary surgery when one is off methotrexate and biologics. (4 to 6 weeks before, another 4 to 6 weeks after surgery for me.) I gained an exquisite appreciation of what methotrexate does for me. I already had regained ability to close my hand into a fist DURING a Remicade infusion. The low-dose, short-term (no tapering off required) course of prednisone was worth its weight in gold, and let me keep moving about gently while recovering from surgery. I didn’t WANT surgery. I don’t WANT methotrexate. I don’t WANT Remicade. I don’t WANT prednisone. I don’t WANT RA. 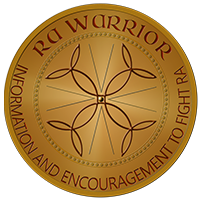 But given that I have RA, it is the better part of valor and a notable sign of intelligence to use all those resources with care and respect for myself, the main effects and the side effects. Whether short-term pain management or triumphantly slowing joint and other damage, I NEED them all. After 13 years of RA, I’m not sure I believe remission really happens. Maybe I’m just not a good enough person. oh Rose I’d hate to think we haven’t seen remission because we aren’t good enough. It’s so hard because people assume that remission or low disease activity is how it is for everyone w/ RD today. Thank you for sharing. It’s so hard to fight the perception that you’re weak for taking medication or succumbing to surgery – when it is the opposite. You are fighting to get as much out of your life as possible. I wish I knew if prednisone would help. Suffering through trying to find out which drugs will work is torture. For some reason I am young middle aged, but already have severe osteoporosis, so my doctor won’t prescribe steroids. There is a lot of pain, with little relief. So for those of you who don’t want to take prednisone, be thankful you can. I can only wish. I have a Rx for prednisone 5 mg to use on a “as needed” basis. I’m also on methotrexate weekly and Cimzia ingections every 2 weeks. I have been in so much pain and the stiffness…I could not even fathom sitting down yesterday because of the stiffness I had to work out when I got up. I literally stood up until bedtime which is absolutely stupid and counter productive for obvious reasons. Today I took 10 mg of prednisone and went from a pain rating of 15 (on a scale 1 to 10) down to a 6 today! I avoid it 90%of the time but can really feel a big difference when I use it. Prednisone is all I could take while pregnant with four of my children. Thankful for it. I continue on 5 mg. forever because I hurt if I try to lower it. The headlines make me think that it is written for the biological pharmaceutical companies. It might be an agenda to promote their products to older patients who have been on prednisone and been hesitant to try biologicals. 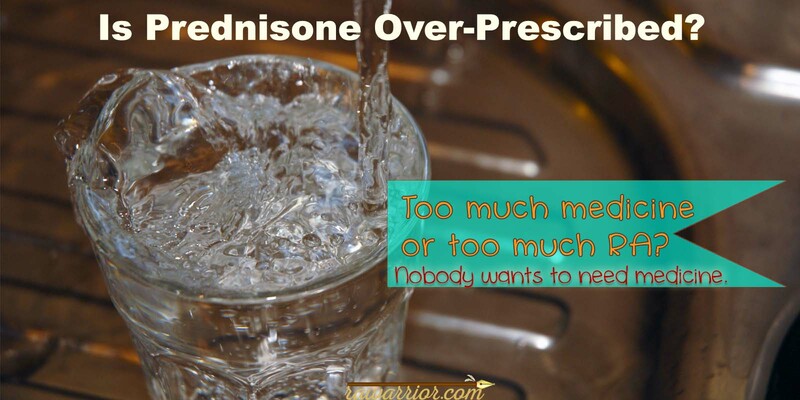 For those of us who can no longer use NSAIDs due to bleeding issues, and find ourselves between working biologics, prednisone can be a life saver. If you use it with caution, knowing the side effects and reserving its use for those critical times when you absolutely cannot travel or function without it, prednisone can become another resource. I am thankful that my rheumatologist trusts me to use my common sense, load properly, taper safely and keep her informed. Rheumatic diseases need teamwork and a good doctor is critical. Good luck, everyone! Whoa, prednisone. The gorilla in the living room. Don’t ignore him, don’t forget to feed him or you’ll be sorry. The vast majority of RD’ers know the monster called prednisone. It’s like needing to burning a burning to relieve the pain. It’s effective but it does more damage than it cures. So the side effects of long term use of prednisone has done with me. Blurred vision and weight gain are two side effects I have when using my daily dose of 5mg. In the fall of 2012 I was forced to stop using it for six months, I lost 25 lbs and didn’t need my reading glasses any more because my vision returned to normal. I also felt better, … … for a while. In January of 2013 I needed emergency back surgery. Made it out of that fine and thought I had the prednisone beat! After five and a half years of daily use I needed none. I won the 600 yard rifle match in Ojaih, CA on March 17th and I was really feeling like I could be free. Although my morning stiffness lasted longer than before. I chocked this up to cold weather and travel stresses. Wrong, one slip and fall in late April brought on the flair of flairs. Unbelievable, I was attending a National Shooting competition and had the most important strings of fire to go on Saturday and Sunday. The 1,000 yard light and heavy gun championships were what I trained for, why I was in a motel far from home and why I invested so much of my energy to my sport. I’ve competed while taking prednisone before and did okay, but in 2013 I was shooting without it for the first time. And doing quite well for a rookie. I got the attention of past champions like Bob Hoppe, Bob Dorton and Gerry Terney to name a few. And I was confident that the 1,000’yard was going to be mine. So I fell on Friday and woke on Saturday with neck pain I’ve never felt before. I hurt so much I needed to have some kids who were there move my rest, gear, and rifle to the line for me.it was all I could do to fire my “light gun” strings. Light gun is defined as a single shot rifle of any caliber with any sight that weighs no more than 18 pounds unloaded. Mine wheighs 17 lbs – 15.5 oz. so it’s not a hunting rifle. On my first string I fired a 3.182″ five shot group at 1,000. That was good, but I was really hurting. On Sunday we shot the 1,000 yard heavy gun and I didn’t do well at all. Long story, short. When I got to my rheumatologist the next Monday I was put back on daily prednisone and I’ve been taking it since. The gorilla got his way. I thought if I ignored him he’d go away and leave me be. But like all of us I found deneial a painful setback. Though my rheumatologist has tried again and again to get me off the daily prednisone my RA kept flairing each time. Finally it came to a decision as to trying again was worth the pain and we decided to leave well enough alone. So now I use 5mg per day forever… …? Who knows, I do know it’s something I can’t ignore. I’ve retired from rifle competition and have only shot once since that match in 2013. This doesn’t mean I’ve quit though. I have a new protégée in the shooting sports and he may be my eyes and hands. Together we could go all the way in 2016. Wish us luck and thanks for the ability to voice my concerns and views here. good luck Roger. We’ll be hoping to hear it goes well. I had to give up my stubbornness against the use of steroids for my RD recently during a biologic change. Switching biologics left me without the ability to function in my daily tasks for about 3 months. Prednisone helped but wasn’t cutting it either. A Kenalog shot and switching to a different steroid (medrol) finally helped me over the hump. But 5 months later I still haven’t quite felt well enough to kick the roids. I’m ready to give it another shot and finally ditch the last daily 5 mg dose, but I have to admit I’m pretty scared. If I can’t make it I have to decide whether to make another biologic switch (lord save me) or go back on medrol (please no). Thank you Kelly for that excellent review of Prednisone issues. I am an expert, unfortunately. I’ve been on Prednisone for more than 10 years, without a break, sometimes low dose, with intermittent periods of high-dose for possible arteritis. I have had almost every side and adverse effect, some minor, many serious and life-altering, especially severe osteoporosis with multiple fractures. However….I also continued working many years longer than I would have. My quality of life has been dramatically improved, both in terms of fatigue and pain. And I feel strongly that the still-inflammatory effects of the Prednisone have limited my joint damage significantly, as well as prevented many of the serious non-joint complications of inflammatory disease. I have tried almost off the RD meds, and most have been ineffective, or have caused major adverse effects equal to those of Prednisone, or have led to frequent infections, causing me to be on and off them constantly. I don’t know if I would have made the same medication decisions if I knew then what I know now….but we all do the best with the information we have, and our knowledge of our own bodies and how they react to the disease and to medications. Sometimes in life we just don’t have a choice. I was diagnosed with RA a few months ago but had symptoms for five years and spent the last 12 months before I was diagnosed in a full blown flair. I’ve never felt so much pain in my life! I’m taking 13mg prednisone daily until I see my rheumy for the second time. I’ve started on methotrexate 5 weeks ago but so far I’ve noticed no improvement. I’ve got a 5year old and a toddler. If I don’t take the steroids I can’t walk. And I dont say that lightly. I’ve dragged myself on the morning school run and been crying by the time I get home because I’ve been in so much pain. But my RA has now progressed even beyond that to the point where I literally cannot put any weight on my foot without steroids. I don’t have the luxury of worrying about side effects until I respond to conventional treatment. I also believe doctors over-prescribe Prednisone. I know that sometimes it is the only option, but it should be used with caution. My mother has several autoimmune diseases, including giant cell arteritis. 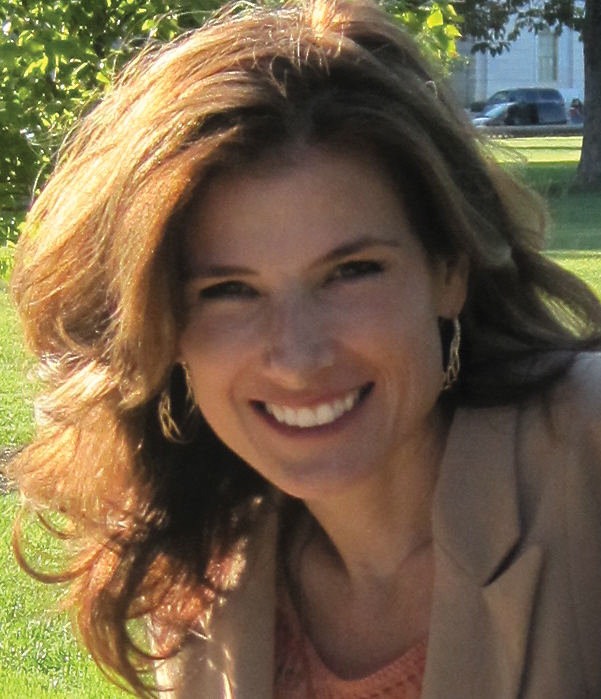 Her doctor had no other choice but to give her long-term high doses of Prednisone. However, she is now suffering the consequences of those high doses. She has had several fractures in her spine and has been bedridden. One of those vertebra is “mush” and there seems to be no hope for that one to ever return to normal. She wants others to know of the dangers of long-term and/or high dose steroid use. Please ask if something else can be used. Since Mom and I share the same doctor, she (our doc) has decided to be extremely careful with me so the doesn’t happen to me. Respectfully, this way of thinking can be harmful. Not being on any sort of DMARD is what may “get you” later because we don’t need to feel pain, see swelling or feel symptoms for the damage to be marching on relentlessly in our heart, joints, lungs & tissue, leading to worse pain, MUCH WORSE PROBLEMS later & even early death. I too do everything your book mentions and way more actually. I’m fanatical & it improved my life with this disease a lot, but it hasn’t taken away either my disease, pain or more importantly, the March of Damage I can’t see going on inside. ..because RAD is incurable, it’s relentless & isn’t stopped even if you feel fine. So at best you have remission and we are joyful for you. ..second best you have very low disease activity. .so happy for you … but what you’re disregarding is that either of those still require at least the mildest of DMARDS to ensure you don’t wake up in 2 years in excruciating pain from fused, damaged, distorted, eroded or irreparable joints, heart, bones, lungs & shortened life. I have made my life & pain better by living a fanatically clean, chemical free, organic life, to an extreme most people would actually laugh at & call me a crackpot (ripping out carpet because of formaldehyde anyone? Lol), but not for one second do I EVER forget the monster marching within me. SO I responsibly take my DMARDS for the now and mostly for the future, because I intend to have one … & it’s my mission to advocate & educate about this subject that seems so absent from medical industry & patients, in that, there is such a disconnect of it between the two I’ve seen, from now thousands of comments in the autoimmune disease community web wide. It’s such a difficult trade off! I’m on all the modern drugs( biologic, etc). But without prednisone, I feel my quality of life is unacceptable. I know I may be trading years off my life, but is a trade I decided I had to make. Especially when the isolation and pain had me researching Dr. Kevorkian. I try to keep to 5 mg, but do increase temporarily for special occasions like family holidays, etc. But, after be a size 6 for the first 30 yrs of my life, I’ve now had 100 extra pounds added from the prednisone. Another big trade off. So wish I was like one of those women in the commercials!! I have been avoiding steroids because of my diabetes. But the few times I’ve had cortisone injections I have felt much better. I wish I could take prednisone but I have difficulty keeping my blood sugar in control. Omg! Do I feel like I fit in with this conversation. I’ve been prednisone dependent for asthma since I was 12, daily and now I’m 67. Yes I had the weight gain up and down but I was able to lose 30 lbs with the carbohydrate exchange system since July 2011 when I was first diagnosed with diabetes. Now, prednisone can give a person without diabetes, diabetes. But I didn’t want more pills or shots. I also started to eliminate all inflammation causing foods. I’ve always been into health and nutrition but I indulged more than I should. I lost another 10 eliminating all starchy carbs, rice, grains, cheese, fruits, over the past 2 years. Low and behold, I got off the minimal diabetes med I was on and was able to wean off the prednisone. My usual dose was 5 mg per day. Now I’m off 3 months but it left me with steroid myopathy. I’m in agony with muscle and joint pain, stiffness and fatigue. And I’m an active person. The drug that saved my life many times is now destroying it. Any recommendations for dealing with this? Thank you for posting this article and having this discussion. There could be something else going on of course – but here’s a thought: It’s possible that you are adrenal insufficient after 50 yrs of steroids. If so, that can be treated with hydrocortisone which is weaker than prednisone. They say even that can be weaned if the adrenals recover eventually. When first diagnosed 15 years ago, treatment was plaquinil,methotrexate, and prednisone. With every flare and they were frequent, the prednisone dosage increased. 134 lbs. To 178 lbs. With ALL the ugly steroid side effects. Years of pain, not occassional, constant! I stopped methotrexate and weaned myself off the prednisone. Lost most of the weight. Still had and have the steroid uglies, but my pain level reduced significantly. I will never again take prednisone.